Now that the hood has been installed and the wiring has been tucked in the classic 1965 Chevy, Rick and the team will begin to work on the gauges. The gauges will be removed from the dash. They will be converting the stock gauge panel first, as they will be replacing the clock with a tachometer. Also, the American Modern team will be replacing the idiot lights with gauges. First, the new gauge will require cutting the metal of the original ’65 Malibu restomod gauge mounting brackets, where the new gauge will stick through. Then mark the places where the mounting holes will be placed. After the cutting, file the edges, drill the holes, and mount in place. Next, the replacement tachometer will be taking the place of where the clock was originally in place in the 1965 Chevy Malibu SS restomod. 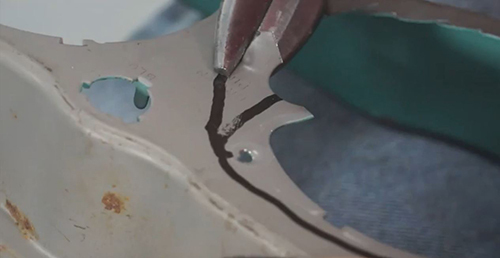 After the tach is set, clean up the areas that are covered with dust and residue from the installation, and get prepared to reinstall the updated mounting bracket. The next step in the process is to install the new lens on top of the three new gauges. The turn signal indicator lenses will be reinstalled next. Back in the day, they had to use a white bulb, then place a green tint, made of a glass circle, to be placed on the outside of the light. The gauge cluster is mounted to the back of the dash, along with the switch panel in place instead of the radio. 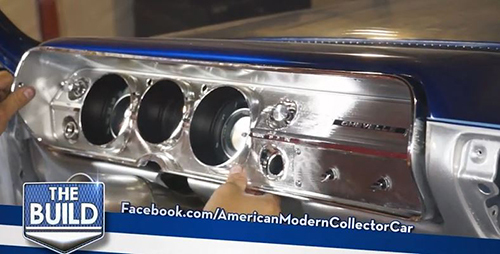 Watch as The Build team continues to put back together the 1965 Chevy Malibu restomod. Make it a priority to watch the other episodes on our YouTube channel, and follow the progress of our collector vehicle on our Facebook page too!